Make you Easter dinner table even prettier with a plate full of these Pastel Rainbow Deviled Eggs. The extra effort is only minutes but the wow factor looks like you spent hours on this easy kitchen hack. Pretty food is always fun to eat! These Pastel Rainbow Deviled Eggs will double as decor on your Easter dinner table and also be fun to eat! Grab my Deviled Egg Recipe before you begin. My family insists that I make deviled eggs for our big Easter and Thanksgiving celebrations year in and year out. They are a little labor intensive but so worth it. Peel and slice the eggs in half. Use a knife with a serrated edge to give a decorative look to the edge of the egg. Scoop out the yolk and set aside for making the egg salad. Place 1 or 2 drops of food coloring per cup until you reach the desired color. Place egg halves in water. Check every few minutes for your desired color. Leave them longer for darker colors and less time for lighter colors. 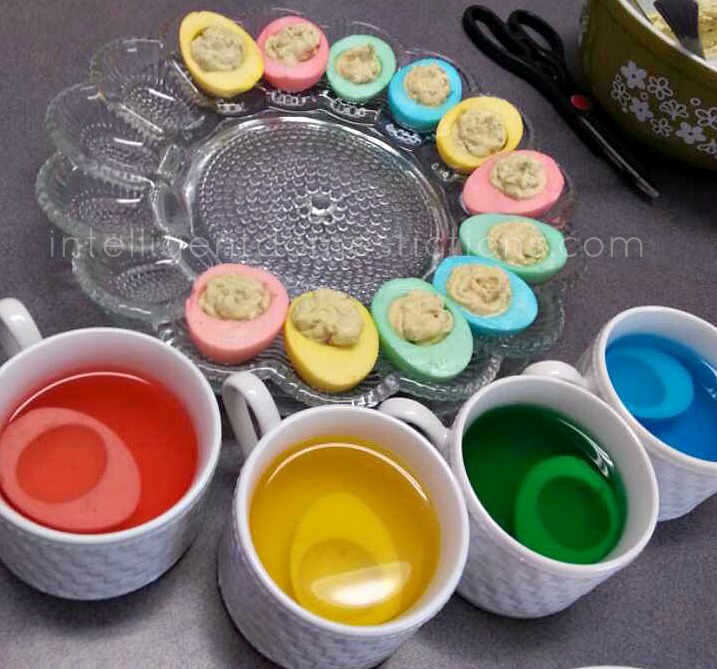 Making these Pastel Rainbow Deviled Eggs is a task the children can help with. They always love learning in the kitchen and this is a fun opportunity for them to help make Easter dinner. You can do this same thing for any occasion using colors to match your theme such as red and blue along with some white eggs for July 4th. Have fun with it and enjoy your pretty table. Ok, I’ve always loved dying the OUTSIDE of eggs, but the inside too? What a smart idea! My kids would love this and you’re right! They do make the Easter table so much more colorful! Those eggs are so cute. I really like the idea of making colored eggs for all year long. It is so much more interesting than just the white ones! Oh My Gosh, so much fun. I don’t have little ones at home any longer, but I would still love to have these on my Easter table. I love your egg plate – I have one just like it. They look so pretty! They’re perfect for Easter and just a fun activity to even get the kids involved with to color the eggs! This is such a neat idea, I never thought about making colored deviled eggs. I usually make mine with dill relish. These are so pretty! What a great display they would be on an Easter Dinner table. Pinned and Tweeted! Thanks for partying with us at Snickerdoodle Sunday. it’s like you colored eggs on the outside carried its color into the inside! How clever! Thanks for sharing at Thursday Favorite Things Blog Hop! I would never have thought of doing this but I must say it looks effective! Thanks for sharing this idea with us at #OvertheMoon just in time for Easter. This will be a lovely way to change up the dish that I bring to Easter dinner every year. Your dish looks so colorful and pretty. These are so cute in pastel colors. Perfect for a Spring bunch or party. My husband loves deviled eggs. I make them with dill sometimes. I like to change the recipe up. Thanks or sharing these beauties at DI&DI. I love these and they are so easy! This would be so much fun for Easter! Thank you for sharing them at the #SmallVictoriesSundayLinkup! I’m looking forward to enjoying these very soon, Easter is approaching too quickly. My family devours deviled eggs like it was the last food on earth. Personally, I am not a fan but I know they would love these for our next gathering. Pinning and scheduled on FB. Hope you have a great week! I’m so glad I came across your posts. I’ll be making these for Easter. I made them in pink and blue for my nieces baby shower last year, they were a big hit. Please share on my Sunday’s Best linkup. Shirley your coloured eggs are beautiful, such a pretty idea. Thank you for sharing on #wednesdayswisdom Have a great weekend. I always make deviled eggs for Easter, I will definitely be making these this year, love it! Lovely! The colors look so pastel and just full of Spring time. It kind of makes you want to grab the eggs off the screen! Love deviled eggs! Yours look so pretty. I hear you on not having a recipe. There are so many meals I make without a recipe. I cannot wait to give these a whirl this year, I’m always looking for something festive to do with dishes for the holidays, I think this would be great for Easter brunch or even blue and red for 4th of July! You’ve inspired me, this post is in my bookmarks! Many thanks!! Thank you Dara. Won’t they help make the Easter dinner table pretty! Thanks for shipping by. I never thought of doing this before but now I can see so many uses for this!! Isn’t it a fun idea though. Any occasion with deviled eggs on the menu would be a fun time to make the eggs match the color scheme. These look fun and festive for a Spring BBQ or that Easter dinner!!!! I totally agree. We need red, white and blue ones’ for our summer pic nic’s and b-b-q’s! Who doesn’t love a good deviled egg? I’m not normally a big fan of eggs, but I do love them deviled. I always use sweet relish, too. Your rainbow colored eggs are beautiful and are perfect for Easter. Alli, my little 6 year old grand daughter took after her Dad, she could eat all of the deviled eggs. I make extra just for them! I knew I wasn’t the only one who loved the sweet relish.